Chip Kelly is a legendary college football coach. In just four years as Oregon’s head coach, he turned the Ducks into a consistent contender, reaching the BCS National Championship Game after the 2010 season. He revamped the offense with his version of the spread. He inspired coaches and an offensive revolution all across college football. Then, after the 2012 season, he left to see how he could do in the NFL. After a few less-than-successful seasons, Kelly came back to college football, replacing Jim Mora at UCLA. UCLA is scheduled to face Oklahoma in Norman in Week 2, so college football fans expected to learn how much Kelly had improved UCLA next week. 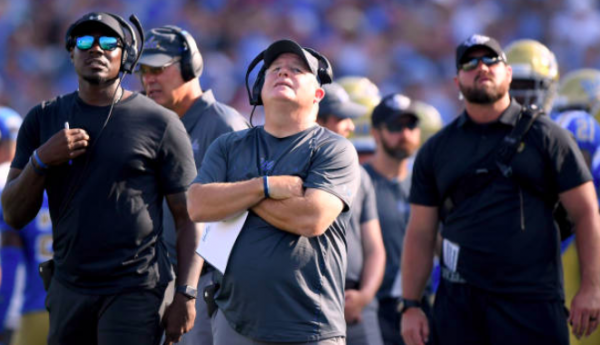 Mora always recruited well and the Bruins usually have talent, so a showdown against the Sooners would show the difference between the Jim Mora and Chip Kelly eras. UCLA will certainly be an underdog next week, but the important thing will be how the Bruins perform. Well, we learned a whole lot about UCLA in Week 1 against Cincinnati, and it wasn’t good. The Bearcats went 2-6 in AAC play last season (4-8 overall), and gave up over 30 points in every single loss last year. UCLA — which certainly has more talent than most of Cincinnati’s opponents last season — couldn’t even muster 20 points. From an offensive perspective, Kelly was certainly not able to work any of his trademark magic. Between their two quarterbacks — freshman Dorian Thompson-Robinson and Michigan transfer Wilton Speight — UCLA only managed 162 passing yards. UCLA’s production on the ground looks better, as the Bruins picked up 144 yards on 31 carries. That number doesn’t look as good, however, when you realize that over half of those yards came on a 74-yard Kazmeir Allen scamper in the third quarter. Not only did UCLA not have much success on offense, but the team didn’t play well throughout the game. Additionally, penalties hurt UCLA- and one proved to be pivotal. On top of that, Kelly’s coaching decisions will be scrutinized. UCLA got off to a good start, going up 10-0 in the first quarter. Cincinnati responded with a dominant second quarter, and the Bearcats took a 17-10 lead going into the half. The teams entered the final quarter tied after Allen’s touchdown run was the only scoring play in the third. It’s about that fourth quarter, though, where Kelly will be questioned most. Cincinnati took the lead with just under ten minutes remaining, after forcing a safety when UCLA recovered a fumble in its own end zone. The Bearcats went three-and-out on their ensuing drive, leaving UCLA with the ball down by two with plenty of time left. Kelly opted to go for it on 4th-and-1 from his own 36-yard-line. On top of that, instead of trying to run and push the pile, he called a pass play. It failed, and Cincinnati took over in plus-territory. On the ensuing Bearcats drive, Cincinnati managed to milk the clock with first downs, and Kelly was forced to call all of his timeouts. The Bearcats were lined to kick a field goal on 4th-and-Goal from the 2-yard-line, but UCLA lined up 12 men on defense. After the ball was moved to the 1, Cincinnati went for it and scored a touchdown, putting the game well out of reach. What exactly does this mean for Chip Kelly and UCLA? Hopefully — from UCLA’s perspective, at least –not much. Kelly still needs time to get his talent in place and build the culture he wants. Based on this, next week against Oklahoma won’t be any prettier than this week. If the Bruins can start to show some improvement, that might give UCLA and Kelly some inspiration moving forward. He’ll have plenty of time to do what he feels is necessary, but this is definitely not the start he or UCLA had in mind.